Have you got a pain in your tooth? Pain can be the first sign that the pulp nerve inside your tooth is decaying and becoming inflamed or infected. What causes tooth infection and damage to the pulp? What are the consequences of untreated pulp infection? Tooth abscess: Once your pulp is infected, bacteria invade the root canals right to the ends of the roots and form an abscess. At this stage, one may experience hot and/or cold sensitivity, tenderness to bite or a constant toothache often disturbing sleep. Sometimes an abscess may go undetected without any symptoms, only to be picked up by a routine X-ray during check-ups. 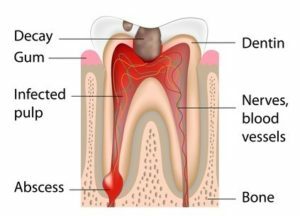 Bone loss and infecting neighbouring teeth: If your abscess is untreated, it will get larger and erode the surrounding bone. Sometimes the infection can spread through the jawbone to the adjacent teeth and its roots. Loss of tooth: If there is extensive damage to the tooth and its surrounding bone, an extraction of the tooth may be the only option to eradicate your infection and relieve the pain. What is root canal therapy and why do I need it? Root canal therapy also known, as endodontic treatment is a procedure aimed to remove your tooth’s infected pulp. This pulp is made up of specialised dental cells, blood vessels and nerve fibres. The most common cause of infection of the pulp is tooth decay. With widespread infection the offending bacteria may eventually reach the central part of your tooth, the pulp. When this infection becomes an abscess, it can cause pain or swelling. In the past, have your abscessed tooth extracted would have been the only solution. With advancements in modern dental technology, root canal therapy can be performed predictably and with a high success rate. This means you’ll be able to keep your tooth and avoid extraction. A tooth requiring root canal therapy is often a structurally compromised tooth. It can be prone to fracture especially under heavy biting forces. If some of your back teeth have had root canal therapy, they may need strengthening with a restoration like a crown or onlay. With proper restoration, good oral hygiene and regular check ups, most patients enjoy full function of their endodontically treated tooth. We discuss your symptoms and examine your tooth in conjunction with radiographs and/or X-rays to make a diagnosis. The number of appointments you will need for root canal therapy depends on the complexity of your case and the extent of the infection. The main aim of root canal treatment is to remove your infected pulp, clean and disinfect the root canals and seal the empty space to prevent re-infection or re-entering of bacteria. The first thing we do is remove all your tooth decay and any old fillings. We the access the infected pulp by making an opening on the biting surface of the tooth and locating all the root canals. 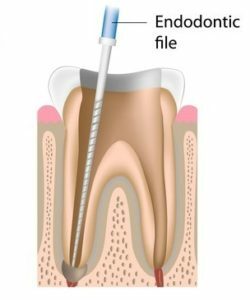 Using endodontic files we then remove the infected pulp, debris and pus. We then thoroughly clean, disinfect and dry all root canals in your tooth. Antibacterial medication is placed as a dressing in each root canal to further disinfect and eliminate any remaining bacteria. A temporary filling is then placed over the opening of the tooth. 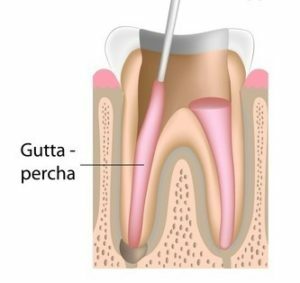 When the infection is cleared, the clean root canals are filled with a filling called gutta percha. This filling permanently seals the hollow root canals and prevents bacteria from re-infecting the tooth. Once the root canal treatment is completed, we place a permanent restoration over the tooth. Clinical studies show root filled teeth have higher risk of root fracture especially when subjected to heavy biting forces. A strong and well-sealed restoration such as a crown or an onlay is often recommended to ensure the long-term success of your tooth. Does a tooth that has had root canal therapy become more prone to chipping, breaking or fracturing? A tooth with root canal therapy is weaker structurally, as it has been hollowed out in the pulp and root canals. 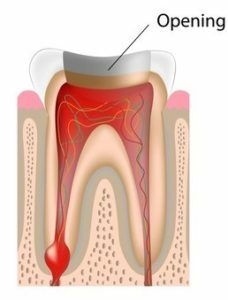 This part of root canal treatment removes all the dead nerve tissues and infections and debris on the inside of your root canals. 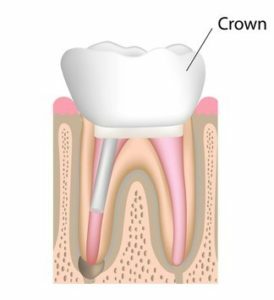 An endodontically treated tooth should be ideally repaired with a crown or an onlay to minimize the risk of chipping and fracturing, and prevent leakage of bacteria back into your root canals. Who can perform root canal treatment? All dentists can perform root canal therapy. At Mosman Village Dentistry, Dr Jennifer Chang has a special interest in and carries out root canal therapy using advanced modern equipment for precision and efficiency. Dr Chang keeps up-to-date with the latest technology in the field of endodontics and uses a dental operating microscope and digital X-rays to provide the best outcome for each tooth. Endodontists are dentists who specialise in root canal treatments. Dr Chang chooses her cases carefully in the interest of her patients, and may refer some complex cases to Endodontists for the best possible outcome. Does root canal therapy hurt? What can I expect to feel? Unfortunately, root canal therapy has had a bad reputation of being a painful experience for some in the past. You’ll be glad to know that root canal therapy should not be a painful procedure – no more than an ordinary filling placement. With an effective and painless local anaesthetic, the tooth and its surrounding area is numb before any work begins on the tooth. Many patients quite surprisingly have a short nap during the treatment as we try our best to make you comfortable throughout the procedure. The best part about root canal therapy? Once the treatment begins any symptoms or toothache subsides and you can chew comfortably again.